NEWARK, NJ- A photo published by the New Jersey State Police has angered residents of the Garden State, whose entire political system is under control of the progressive left sect of the Democrat Party. 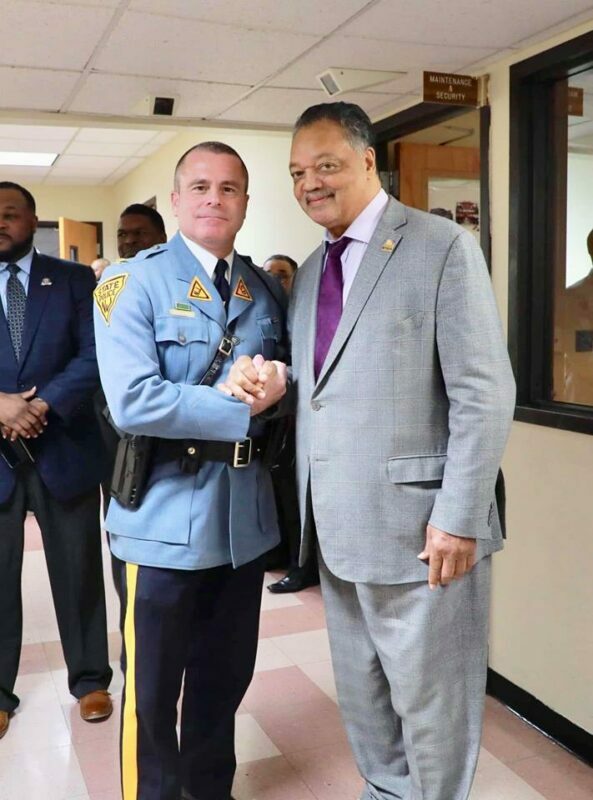 In that photo, Colonel Patrick Callahan, the chief of the New Jersey State Police posed with anti-cop antagonist, Reverend Jessie Jackson, embracing in a “bro shake”. Callahan attended a dinner hosted by Reverend David Jefferson and the City of Newark to honor Reverend Jesse Jackson at the Metropolitan Baptist Church in Newark. The department said the event was a “special evening”. Jackson has not been a fan of police. He often travels around the country where situations grow tense between police and African American communities in an attempt to politicize the events to promote his own agenda as an antagonist against law enforcement. Not everyone who saw the photo thought it was a “special evening”. “The man never has a good word about police and yet here we are. Pure politics. BS,” said Joe Leighthardt. “Sad…First no cooperation with ICE and now appearing with such as this…Bad for NJSP … and all the Troops who do such a great job…Sad,” wrote Fred Mason. ” What’s next? Shaking hands with Joanne Chesimard? disgrace,” asked Robert Lopez.